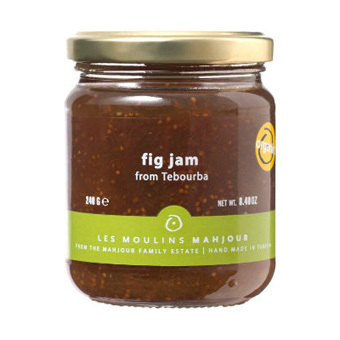 As history suggests, figs thrive in the Mediterranean environment, and whole pieces of this fruit have been preserved in making Les Moulins Mahjoub Fig Jam. A delicious accompaniment to cheeses, fig jam can be served over warm brie with crackers. Slather over toasted French or Italian bread slices topped with prosciutto. Certified organic. Les Moulins Mahjoub is a fourth generation owned and operated family company located in the fertile Mejerda Valley of North Central Tunisia. Heir to a rich agricultural tradition, Les Moulins Mahjoub company, based in Tebourba, produces a range of traditional Mediterranean products. Tebourba is one of a few towns in Tunisia whose population has a quite special original character. It is composed almost entirely of descendants of the Moors driven out of Andalucía who settled on the site of the old Tuburbum Minus, on the left bank of the Medjerda. The district of Tebourba is rich and fertile. It produces large amounts of cereals; there are abundant crops of olives, market gardening (truck farming) is highly developed and very varied. 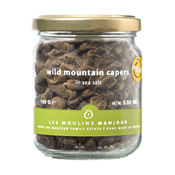 Exceptionally good soil and growing methods that respect the natural and biological balances of nature, combined with the use of traditional farming methods and hand processing techniques, enable Les Moulins Mahjoub 'haute couture' products to be made, meeting the most stringent quality standards. All Mahjoub products are produced with no additives or artificial processes.